How do I insert the MS Calendar control in my worksheet? Note: Read the info good, if you want a solution for all excel versions a custom calendar in a add-in is a better option, check out the links on top of this page for more information. Use Insert-Object on the Worksheet Menu Bar. Select the control in the list and press OK.
On the Developer tab use Insert > ActiveX Controls….More controls. Click on a cell on your worksheet. Press the "Design Mode" button next to the "Insert button" to turn of Design Mode. In Excel 2010 : File>Options..Customize Ribbon, check Developer in the Main Tabs list on the right. It is possible you don't see it in the list, because it is installed with Access in Excel 97-2007. So if you don't have that program installed you possible don't have the control. Note: The control is removed from Office 2010 but you can register the 2007 version. This will only work in Excel 2010 32 bit. If you don't have the control you can download it, see the link on the bottom of this page. Note 1: If you protect your sheet in Excel 97-2000 then you must format the range first with the Date format you want and remove this line ActiveCell.NumberFormat = "mm/dd/yyyy" In Excel 2002 and up you be able to protect your worksheet and allow Format cells. Where do I copy the code? After you insert the control on your sheet you can add the code in the worksheet module. Right click on the sheet tab and choose view code. Paste the code in the sheet module that is active now and press Alt-Q to go back to Excel. Note: Calendar1 in the code below is the name of the control. Tip 2: If you want that the calendar disappear when you click on a date in the control you have two options. After ActiveCell.Select in the Calendar_Click event add this line. You can use the code below if you also want to insert the week number in the active cell. The examples use the DblClick event to insert the week number and week day in the cell. If you also want a to be able to use the Calendar control to add the Week Number and Week Day in the active cell you can copy this event also in the sheet module. 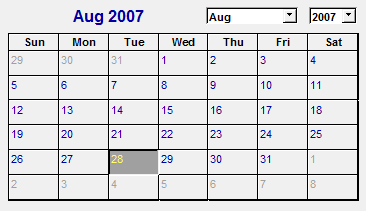 If you DblClick on the Calendar the Week Number and Week Day will be placed in the active cell. You also need the function below to use this. Copy the function in a normal module of your workbook. If you want to use the ISO week number instead of the Excel week number then use the following code.